WE NOW OFFER THE DBX2 IN BLACK - DESKTOP UNIT IS NOW ON SALE! 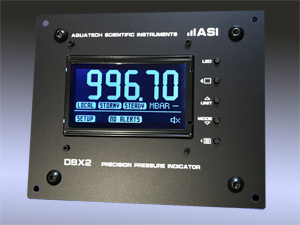 Aquatech Scientific Instruments (ASI) is proud to introduce our new DBX2 precision pressure indicator. It's a Storm Warner / Fair Weather Alert device for use in multiple applications including meteorology, forecasting, research and use in manufacturing. Key Features of the DBX2 include: A large easy to read graphics display, A high-end Bosch Pressure sensor with onboard temperature conversion, Precision milled anodized aluminum case, Supports multiple units of measure: mb, inHg, mmHg, psi, h20, atm, pas, includes a one Day Graph and a one Week Graph, Ability to display multiple formats at once. Display customizations, Forecasts, Audible and visual alerts and warnings. Display Sea, local and User definable pressures. Ability to add new features through the units upgradable firmware. The DBX2 barograph barometer is a simple to use, low-cost, highly reliable early warning system for detecting low pressure storm systems approaching. Showing a clear one day and a one week weather time barograph image on a well back-lit digital display. The DBX2 barograph barometer is a stand-alone unit and requires NO connection to the outside world. The DBX2 barograph barometer is both battery or a/c powered! 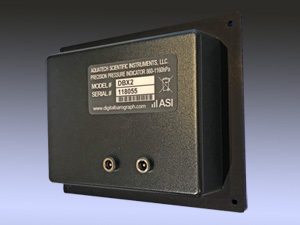 Each unit is fully tested and calibrated and includes a Nist Test Certificate. See the Closer look and Support pages for details. General applications include: Meteorology, Marine World, Research, the Mining Industry, Cleanrooms, Oil Platforms and Refineries, Laboratories, Medical and Health Related Fields. Even the best barometer shows only the current pressure, nothing more. Knowing the pressure is like knowing the Dow Jones average for any given moment: we really need to know which way it is heading, and how fast. 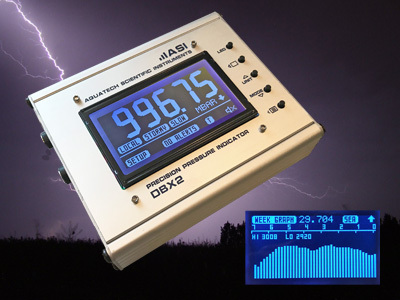 The DBX2 is a precision digital barometer with graphing, also know as a barograph. Barographs are recording barometers. The DBX2 precision digital barometer displays a (1) day graph and a (1) week graph, making weather changes easy to observe. The DBX2 also shows a trend indicator (up, steady, or down) and the rate of change ( steady, slow, medium, or fast). And since changes in pressure generally precede new weather, the DBX2 precision digital barometer can help us "see" what's coming. As an example, rising pressure most often indicates clearing and cooler, where as falling pressure usually points to warmer, more cloudy, and possible precipitation. A rapidly falling pressure is almost always accompanied by a storm with high wind conditions. And a rapidly rising pressure is almost always accompanied by higher winds and clearing conditions. An unchanging pressure means continuing conditions and little wind. The crest or trough of a pressure curve most often indicates a change of wind direction. See the graphs and their meanings on the Closer look page! The DBX2 monitors these changes for you and indicates warnings when necessary! With these forecasting tips you can use the DBX2 precision digital barometer as your first line of defense against oncoming weather.